Before 2014, the average layperson had no idea who the Guardians of the Galaxy were. Being a relatively obscure Marvel Comics title, the announcement that it would be adapted into a film in the ever-growing Marvel Cinematic Universe surprised and confused fans and casual movie-goers alike. Most believed it would be a flop. They were wrong. The film was a surprise hit, and its sequel, Guardians of the Galaxy, Vol. 2, became one of the most anticipated films of 2017. And thankfully, it lives up to the hype. The sequel once again picks up with the ragtag group of mercenary heroes, led by Peter “Star Lord” Quill (Chris Pratt), who was kidnapped from Earth as a child and raised by space pirate Yondu (Michael Rooker). While on the run from the very golden and highly sensitive High Priestess Ayesha (Elizabeth Debicki), Quill and the Guardians are met by Quill’s long-lost father Ego (Kurt Russell). With Rocket (voiced by Bradley Cooper), Groot (voiced by Vin Diesel) and Yondu held captive by Yondu’s mutinous crew, and the villainous Nebula (Karen Gillan) out to seek revenge on her adoptive sister Gamora (Zoe Saldana), the Guardians have to once again overcome their own differences and past issues to save the galaxy. The driving force behind this film, just as it was for the first film, is the light-hearted, fun-filled tone. A true genre-bender, the sequel mixes comedy and science-fiction and action-adventure to create something truly original to the Marvel Cinematic Universe and comic book movies in general. With genuine laugh-out-loud moments, it separates itself from other, more self-serious franchises in spectacular fashion. It also manages to thread in some real dramatic and emotional points, as the nature of “family” is considered, between Quill, Ego, and Yondu, Gamora and Nebula, and the Guardians as a whole with black sheep (er, raccoon) Rocket. Of course, the scene-stealer is once again the tiny tree person Groot, now a toddler after being “replanted” at the end of the first film. Adorable and preciously dim-witted, he furthers the parallel of “family” as the other Guardians treat and protect him as a child. And once again, Pratt carries the emotional center of the film, wrestling with the aspect of a new near-perfect family with Ego or to continue alongside his dysfunctional, surrogate family, the Guardians. While the first film was a surprise hit, it will surprise no one that this film is destined to be in Marvel’s top films. And fans will once again eagerly anticipate Vol. 3 when it rolls around. Guardians of the Galaxy Vol. 2 is the perfect continuation of the first film, without falling into the same template as the first. While the tone and style of the film remain the same, this installment is filled with plenty of character development, story arcs, and surprises. Guardians of the Galaxy Vol. 2 is now in theaters, you can find tickets by clicking here. Mix together all of your granola ingredients (not the topping ingredients). Line a cookie sheet with parchment paper, and spread your granola mixture along the whole pan. Place in the oven and bake for 15-17 minutes. Allow the granola to cool or about 15 minutes. Make your green topping mixture by combining your white chocolate chips and oil by heating it on the stovetop. Melt it on low heat and stir frequently. 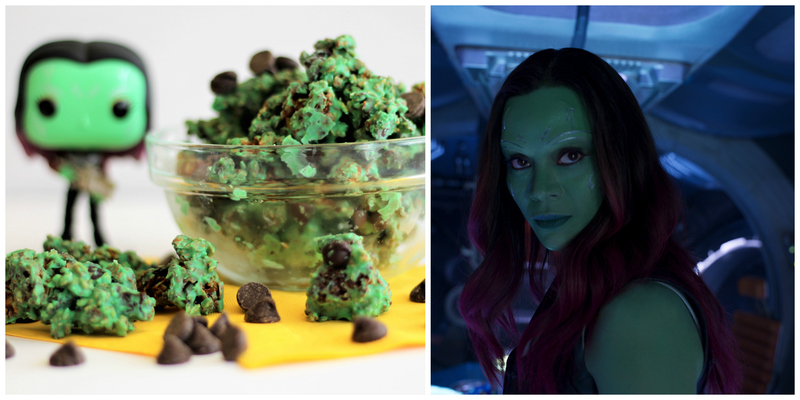 Once melted, mix with your green food dye or matcha. Then pour mixute into a large bowl. Break a part your granola into chunks, and pour it in the green mixture, stirring to coat all of your granola. Top with dark chocolate chips and place in the fridge for 30 minutes. It’s now ready to enjoy!